Ammannia gracilis is a plant native to West Africa in marshes, streams and riverbanks. Description: Stem plants have narrow, rather wavy leaves, growing opposite on an often robust stem. Depending on the light intensity, the leaves vary from a pale green to a bronzy red colour. They grow to about 12–20cm (5–8 inch) or longer. The flowers are inconspicuous, growing from the leaf axils of emerse plants. A group of several stems planted midground will soon form a bushy backdrop for a shorted carpet of lighter green foreground plants. Care: Emersed plants are tougher and hardier than the delicate submersed form. Ammannia gracilis prefer much light for optimum growth. They can grow quickly in the right conditions and will grow emerse if the water is shallow enough. They grow well with additional carbon dioxide added to water. Ideal water conditions are soft and acidic but these plants are generally hardy and adaptable in most moderate conditions. To grow well they need a good iron micronutrient added to the aquarium. Ammannia gracilis can be kept emersed as well. Once the stems reach out of the water surface, leaves will turn greenish red. Water: This stem prefers mildly acidic to moderately soft water. Light: Lighting should of Medium to High. If not given strong enough light, Ammannia gracilis will loose its lower leaves, growth will decrease, and remaining leaves will be pale and sickly. Temperature: Water temperature should be ranging between 22-28°C (72 – 82°F) with a very minimum of 15°C (59°F). Fertilise: Recommended Co2 Injection. Supplement iron and macronutrients. If Ammannia gracilis does not receive iron and high lighting, then the leaves will turn a pale pink to green in colour. Pruning: Pruning should be done by topping and replanting the more robust top portions. Special care: Delicate leaves grow quite quickly when provided with a nutrient rich loose substrate, gentle water circulation and adequate feeding. Low nitrate promotes the desirable reddish colouration. 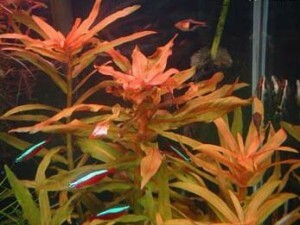 Uses: Ammannia gracilis tend to grow large in the aquarium, so a minimum 0.6m (2feet) tank should be used. Stems can reach 1cm (0.4 inch) thick with leaves atleast 10cm (4 inch) long. Stems and Side shoots can be cut off and replant, the old base of the stems would produce new shoots from the leaves if the top of the stem is cut off. If you would like a more bushier plant, then it is recommended to cut the stem in the middle when the top reaches the surface. A. gracilis, due to its eventually large size, is most suited to the midground to background of aquariums larger than 76L (20g) where it can add a brilliant splash of color to any layout, using it for contrast to the typically green streets. .
Propagation: Ammannia gracilis can be easily propagated by cuttings pushed into the substrate. Cuttings are obtained by removing side shoots from the main stem plant with a pair of scissors. Take care when planting not to put all the stems in one hole. Plant each stem adjacent to the others but in individual holes. This will help ensure that the lower leaves are not deprived of light and water circulation.